BTWT doesn’t usually cover North American railway news. We prefer to write about matters that we know something about! But headlines that Union Pacific Railroad’s “Challenger” No. 3985, the world’s largest operating steam locomotive, will be on a five-state, 1,750-mile tour from Cheyenne, Wyo., to St. Paul, Minn., to celebrate railroad heritage caught our eye and prompted us to look up the Union Pacific website. Just typing ‘steam’ into the search box leads to a veritable goldmine of information about UP’s steam locomotives and railtours. It’s a great pity that information about PKP’s steam excursions and steam galas isn’t so easy to find. Union Pacific Challenger No. 3985 was designed by Union Pacific and built in 1943 by the American Locomotive Company. It is one of 105 Challengers built for Union Pacific between 1936 and 1943 and is the only operating engine of its class in the world today – the largest and most powerful operating steam locomotive in the world. One other Challenger, No. 3977, is preserved as a static exhibit. No. 3985 last operated in “regular” train service in 1957. It was retired in 1962 and stored in the roundhouse in Cheyenne, Wyoming, until 1975 when it was placed on display near the Cheyenne depot. A group of Union Pacific employees volunteered their services to restore the locomotive to running condition in 1981. The name Challenger was given to steam locomotives with a 4-6-6-4 wheel arrangement. This means that they have four wheels in the leading “pilot” truck, which helps guide the locomotive into curves; two sets of six “driving” wheels, and finally, four “trailing” wheels, which support the rear of the engine and its massive firebox. Each set of driving wheels has its own steam cylinder. In essence, the result is two engines under one boiler. Union Pacific’s No. 3985 is 122 feet long. It weighs more than one million pounds, has six-foot diameter drive wheels and can reach a top speed of 70 miles per hour. No. 3985 was built in 1943 for fast freight service and was retired in 1959. In 1981, it was restored to running condition by UP employee volunteers for special service. The locomotive is based in Cheyenne, Wyoming. The Challengers were designed for fast freight service, but occasionally pulled passenger trains. No. 3985 originally burned coal and pulled a tender with a 32-ton capacity. In 1990, it was converted to use No. 5 oil. The locomotive is 122 feet long, weighs more than one million pounds, has six-foot diameter drive wheels and can reach a top speed of 70 miles per hour. No. 3985 was built in 1943 for fast freight service and was retired in 1959. In 1981, it was restored to running condition by UP employee volunteers for special service. The locomotive is based in Cheyenne, Wyoming.. Technical specifications for the UP’s Challengers can be found here. A Global Positioning Satellite (GPS) transmitter has been installed on one of the rail cars that will travel with No. 3985. The GPS system has been integrated with a map on the UP website. The GPS system will update the map every five minutes showing Challenger’s position. Friday, Sept. 19 – Sunday, Sept. 21, North Platte, NE. St. James, Minn., Sept. 30. Although No. 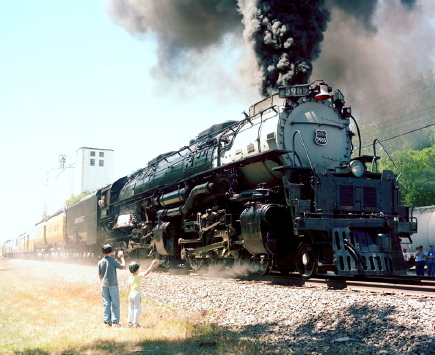 3985 is the world’s largest operational steam locomotive, it is not the largest steam locomotive ever delivered to the Union Pacific. The biggest engines on the UP were the giant “Big Boys“, arguably the biggest production run (as opposed to experimental “one offs”) steam locomotives in the world. Twenty-five Big Boys were built exclusively for Union Pacific, the first of which was delivered in 1941. The locomotives were 132 feet long and weighed 1.2 million pounds. They had a 4-8-8-4 wheel arrangement, which meant they had four wheels on the leading set of “pilot” wheels which guided the engine, eight drivers, another set of eight drivers, and four wheels following which supported the rear of the locomotive. The massive engines normally operated between Ogden, Utah, and Cheyenne, Wyoming. world. 8 “Big Boys” have been preserved, though sadly none are in working order. This entry was posted on Friday, 19 September 2008 at 01:21 and is filed under Uncategorized. You can follow any responses to this entry through the RSS 2.0 feed. You can leave a response, or trackback from your own site. Dang it, good post brothers!! !, Friday I got a post coming out on Alco DL109’s then the day after (Saturday) I got a post on # 3985 w a 70 mph utube shot, I’m sorry we are on the same territory, but when it comes to trains the more the merrier!!! Our territory is from Land’s End to the Estonian/Russian border with a strong Polish and British focus, so have no fear about us treading on your toes. Occasionally, if we see something really out of the ordinary happening elsewhere, we may stray outside the box. The No. 3985 story is pretty extraordinary and the way that UP use her for publicity is something that PKP in Poland would do well to study. Please feel to repost on your blog subject to crediting the BTWT as the source. I love the video on the above link, we do follow European Rail also here. The photo here on your website with the two boys in the foreground, could you tell me its source so I can get a higher resolution picture for use as Desktop Wallpaper please? Sorry, but we did attribute the photo to the Union Pacific Railroad (UPR). It is, of course, from that company’s website and can be seen full size by clicking on the thumbnail here. Does anyone remember the “D & H” railroad? There was a train station in Carbondale, Pa., and there were many four cylinder locomotives, (4880’s), that hauled coal out of Carbodale, before wwii! I remember watching from “Sandy’s Field”, which was a high point overlooking the railroad! My name is Rick cimino, and I lived at 11 vine street, on the west side of Carbondale., before entering thermy in 1943! The west side was escavated after the second World war, and to my knowledge, now, non-existant. There was a mine fire that lasted for several years, before the fire was cleaned up!